Use environment-standards-based reference models to model standard atmospheric, gravity, and magnetic field profiles. Use ephemeris data to calculate position and velocity of celestial bodies. Use Add-On to add ephemeris and/or geoid data. Examine the zonal harmonic, spherical and 1984 World Geodetic System (WGS84) gravity models for latitudes from +/- 90 degrees at the surface of the Earth. 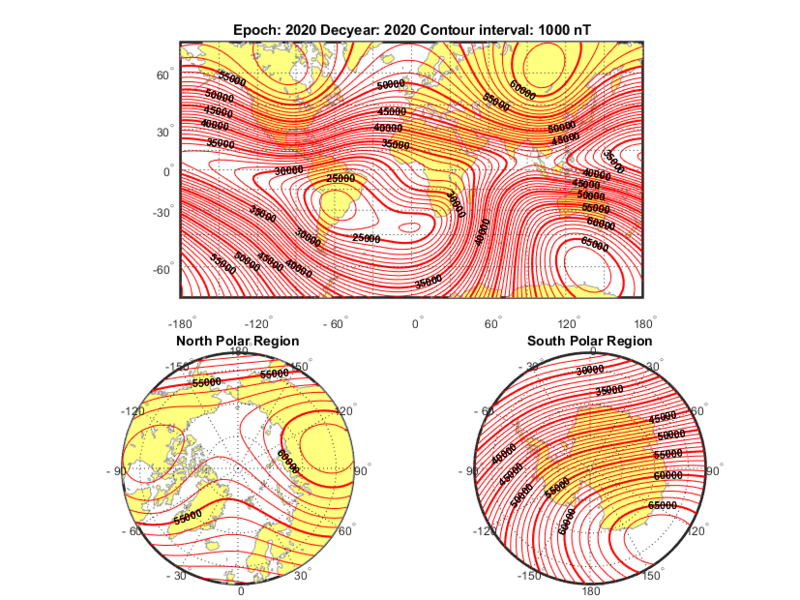 Visualize contour plots of the calculated values for the Earth's magnetic field using World Magnetic Model 2015 (WMM-2015) overlaid on maps of the Earth. The Mapping Toolbox™ software is required to generate the maps of the Earth. Calculate the Earth's Geoid height using the EGM96 Geopotential Model of the Aerospace Toolbox™ software. It also shows how to visualize the results with contour maps overlaid on maps of the Earth. The Mapping Toolbox™ and Simulink® 3D Animation™ are required to generate the visualizations. Use the planetary ephemerides and a Earth Centered Inertial to Earth Centered Earth Fixed (ECI to ECEF) transformation to perform celestial navigation of a marine vessel. Estimate the analemma of the Sun. The analemma is the curve that represents the variation of the angular offset of the Sun from its mean position on the celestial sphere relative to a specific geolocation on the Earth surface. In this example, the analemma is estimated relative to the Royal Observatory at Greenwich, United Kingdom. After the estimation, the example plots the analemma.